WASHINGTON (CNN) -- Bucking tradition, U.S. Secretary of State Hillary Clinton will bypass Europe and travel to Asia on her maiden voyage overseas, diplomats familiar with the planning said Tuesday. 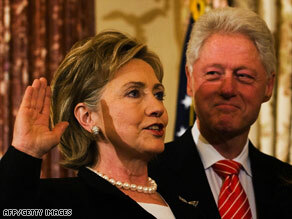 Bill Clinton looks at his wife Secretary of State Hillary Clinton as she is sworn in on February 2. Clinton is expected to visit China, Japan and South Korea on her first trip overseas. The diplomats said she may also add other stops, including one in Southeast Asia. The diplomats spoke on condition of anonymity because Clinton's schedule was still being finalized. The State Department has not commented on her travel plans. Making Asia Clinton's first overseas destination illustrates the Obama administration's desire for a broader partnership with China and its commitment to resolving the North Korean nuclear issue, as well as strengthening ties with Tokyo and Seoul, the diplomats said. The White House said President Barack Obama told Chinese President Hu Jintao in a Friday phone call that he looked forward to "to early contacts and exchanges between senior officials of our two countries." Clinton told the Senate Foreign Relations Committee last month she hoped to make an early trip to Southeast Asia, in particular Indonesia, the world's most populous Muslim-majority nation where Obama spent part of his childhood. Clinton said she wanted to restart Peace Corps programs there, which were suspended in the 1960s. Traditionally U.S. secretaries of state make Europe or the Middle East their first official trip overseas. But given that Vice President Joseph Biden is headed to Europe this week for a security conference in Germany, and special envoy George Mitchell is currently in the Middle East, Clinton is free to break with tradition. However British Foreign Secretary David Miliband and German Foreign Secretary Walter Steinmeier will be Clinton's first foreign guests to the State Department on Tuesday. Biden administered the oath to Clinton in a ceremonial star-studded gathering at the State Department, with actor Chevy Chase and designer Oscar de la Renta among those on hand. "It is an overwhelming honor ... to assume this position," Clinton said. "We have a lot of work to do [to ensure that] America's future can be even brighter than our storied past."